Welcome to a training video blog post, fasters! I am starting to get my Intermittent Fasting Journal FB group videos up at Youtube and on to the blog! Thanks for bearing with me as I get all of my systems in place for my readers and viewers. I am so excited about the opportunity to bring HOPE to people who are seeking a way of living, eating, and managing health/weight that allows us to “do nothing and enjoy everything”! 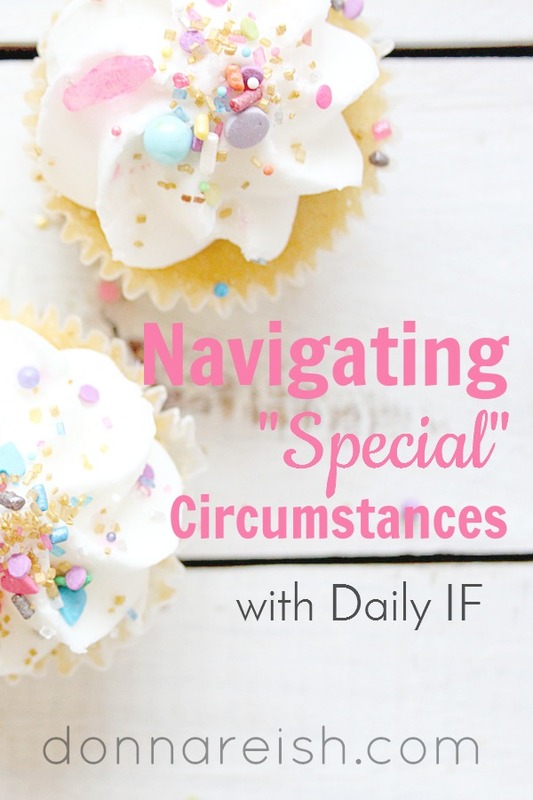 Today’s video teaches fasters what to do about those “special occasions”! (And how to know if THIS is even one of them each time!) I start out with my mantra that I raised my kids with when they wanted “exceptions” to our schedule (“Can we skip math today–it’s a special day because we have a dentist appointment!” lol): “Every day can’t be a special day even though every day is special.” Then move into determining what really are special days, tweaking your fasting schedule when needed, planning for truly special occasions, and not punishing yourself for special occasions. Don’t forget to contact me with questions, and I’ll get them answered in the FB group, on the blog, or in video! 2. New lifestyle mentality–we don’t need all of those special occasions anymore! C. What is truly special? 2. Which days can you be close to your normal fasting window? 3. Which days can you be close to 16 hours of fasting?